The 60th American Society of Haematology Annual Meeting and Exposition is taking place from 1-4 December in San Diego, USA. The meeting is providing a huge educational experience and the opportunity to review thousands of scientific abstracts highlighting updates in the hottest topics in haematology with the attendance of more than 25,000 health-care professionals as well as many patient advocates. We are pleased to share with you our first "ASH 2018 Report", contributed by our co-founder Jan Geissler. Prof Dragana Milojkovic from the Hammersmith Hospital, London, UK, reported at the iCMLf Forum at the annual meeting of the American Society of Hematology #ASH18 about treating CML before and during pregnancy, specifically when pregnant women are diagnosed with CML during their pregnancy, or when female CML patients on TKI therapy wish to plan a family. About 7.5%-12% of CML patients are less than 29 years of age at the time of diagnosis in western countries, and in emerging countries, the median age of diagnosis of CML is between 30-40 years, so there is a strong need for those young patients to discuss family planning. In addition, less than 1 in 100.000 pregnant women show a CML diagnosis during pregnancy. When CML is diagnosed in pregnancy, the available therapeutic options include introducing CML therapy like Interferon, TKI or Hydroxyurea, or alternatively the regular reduction of white blood cells using leucapheresis, or termination of the pregnancy. Leucapheresis, where white blood cells are filtered from the blood, aims to keep white blood cells below 100.000 and platelets below 600.000 during the pregnancy. The frequency of leucapheresis varies between patients and at different time points during pregnancy: alternate days, weekly or fortnightly – the frequency reduces in the third trimester. Non-pegylated Interferon can be given at 6 million units 3 times a week. Peg-IFN is considered teratogenic due to the accumulation of polyethene glycol in the body, but there is no clinical evidence of a problem, so it is applied also in CML. In terms of TKI, there have been a number of single case reports of Imatinib during CML therapy, even though not advised. There is little concrete data. Therefore, it is advised that women should avoid exposure to TKI during pregnancy. As of data shown from 2008, 50% of pregnancies with TKI exposure demonstrated live births without congenital abnormalities, the other 50% have demonstrated issues. Imatinib during the third trimester seems to be not associated with developmental abnormalities to date, even though there is no concrete data supporting its use in the third trimester. Hydroxyurea in pregnancy is reported to be teratogenic, associated with placental ageing and pre-eclampsia. It seems, however, to be less damageful than expected, as reported by investigators through a toxicology registry in sickle cell disease. NCCN states that HU has been shown to be safe (see NCCN CML guideline, 2018 version). Management of fertility and family planning should begin at CML diagnosis and should be considered in immediate and future treatments. If possible, make provision for maintenance of fertility now. TKI effects on the ovaries are unremarkable. Nilotinib crossed the placenta poorly (with the placenta being formed at weeks 12-14). However, there is very little data and case reports available about the use during pregnancy. Dasatinib crosses the placenta, is extensively distributed, is teratogenic and can induce problems at any stage of pregnancy. Single case reports of Dasatinib exposure during pregnancy have shown 33% reported normal life infants, 49% elective termination, 17% spontaneous abortion, and 11% abnormal pregnancies. In the case of unplanned pregnancy, a risk/benefit evaluation should be made, with careful counselling of patients. The needs of mothers who require optimal cancer therapy need to be balanced against the potential teratogenicity to the fetus. It is advised to stop TKI treatment, not to treat until white blood calls exceed 100.000, and consider to treat with Interferon thereafter. In parenting attempts of 35 young female patients treated at the Hammersmith hospitals, 72% of patients lost Major Molecular Response (MMR) during pregnancy, 11% lost complete hematological response (white blood cells and/or thrombocytes out of bounds), and 90% (but not all) regained MMR after pregnancy. The usual advice given to women with CML treated at the Hammersmith Hospital who wish to become pregnant is: women should be at least in major molecular response for at least 24 months, a wash-out period of the drug is not really necessary and treatment could be stopped e.g. at the end of a menstrual cycle. During pregnancy, patients should be regularly monitored with PCR and no treatment applied as long as the patient remains in MMR or CMR, and Interferon could be started in 2nd trimester if PCR starts to rise. After delivery, breastfeeding is contra-indicated. A nuchal scan should be done in the 11-13th week. 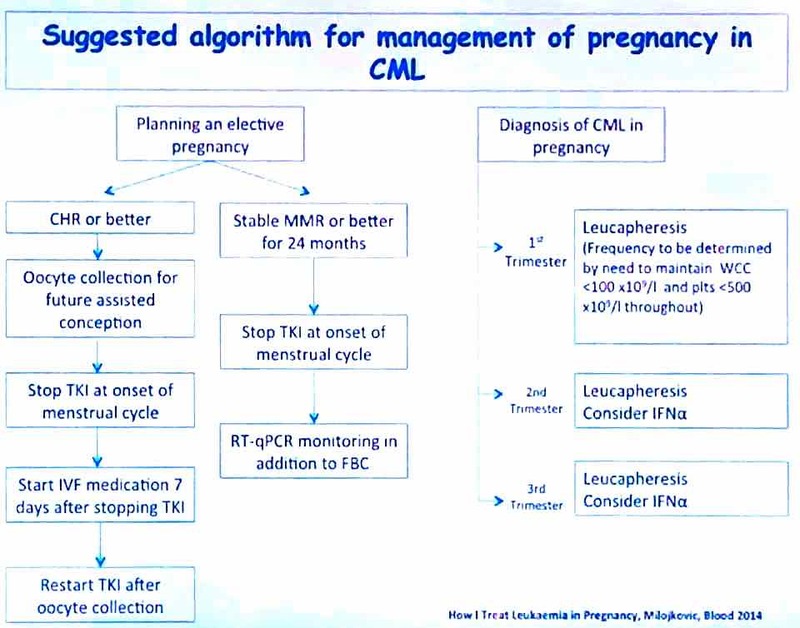 In summary, the suggested algorithm for the management of elective pregnancy during CML treatment, and management when CML is diagnosed during pregnancy, at the Hammersmith Hospital was demonstrated in the attached chart and published in 2014. To download this document in the pdf version, please click HERE.